This blog is by the Mother of an Autistic boy who has Pathological Demand Avoidance (PDA). She describes the family's experience of negotiating the health and education systems, as well as day to day life living with this lesser known profile of Autism. 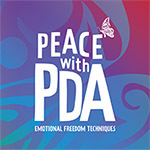 Lindsay shares a simply fingertip tapping technique known as EFT with parents and carers of children and young people with PDA to reduce stress and anxiety. Her gentle and self loving approach to PDA allows the parent to feel at peace with themselves so they may gain the strength and compassion that goes hand in hand with PDA. Home educating Mum of one, raising awareness and supporting parents of PDA children, through blogs and social media. We're a family of three from the United Kingdom. Our 7-year-old daughter (Little Miss M) has Pathological Demand Avoidance (PDA). Through this blog we will share our journey through life with PDA from our daughter's perspective and our perspective as parents. This is the blog of a teenager living with a brother who has PDA (undiagnosed), and Asperger's traits. The reality of one parent's dealing with an extreme behaviour autistic kid.